PEN America’s Handbook for Writers in Prison features detailed guides on the art of writing fiction, nonfiction, poetry, and screenplays as well as information on punctuation, cover letters, and a list of recommended magazines and journals that consider work for publication. This is an invaluable resource to any incarcerated writer. To date, PEN America has distributed over 20,000 copies of the Handbook, and continues to receive requests. Please consider making a donation to the Prison Writing Program. Your support will not only help us publish future editions of the Handbook, but will also help provide hundreds of inmates across the country with skilled writing teachers and audiences for their work. 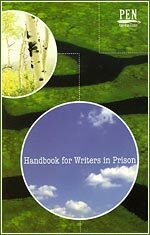 Workshop instructors who would like to use the Handbook for Writers in Prison for classes are encouraged to purchase copies. Please note, our orders are submitted monthly. We ask for patience when waiting for your handbook to arrive. If you or someone you know is currently incarcerated, you are eligible to order a FREE copy of the Handbook for Writers in Prison. Please note, our orders are submitted monthly. We ask for patience when waiting for your handbook to arrive.